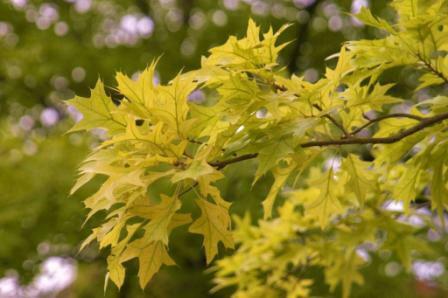 Chlorosis in plants is a condition where leaves turn yellow with dark green veins. It happens primarily on the newest growth first. The "chemical pushers" shoot from the hip and diagnose this discoloration as “iron deficiency” and prescribe iron and sulfur products. Like most purely chemical recommendations, this is bad advice. Iron may not be the only deficiency. Chlorosis is often a deficiency of many elements – iron, magnesium, manganese, zinc, molybdenum, and many others. One of the most common causes of chlorosis is the use of high nitrogen synthetic fertilizers. The key to solving this problem is to stimulate the biological activity of the soil so that the “tied-up” minerals in the soil are made available to plants. The one product that will probably be the most effective is Bio S.I. The overall solution to the problem is to apply the entire Sick Tree Treatment and add epsom salts or sul-po-mag if magnesium is deficient in the soil which is the case in most soils. Oh, and of course, go organic. Greensand can help by itself because it contains many trace minerals including iron. Greensand is the only iron supplement I recommend. There is one more possible reason for the yellow chlorotic leaves on plants - the plant is not adapted where it is trying to be grown. The photo is a perfect example. The shot is a pin oak planted in alkaline soil. The solution? Don't do that.